Season Three Returns in September, 2017! NEWS!!! Released on Wednesday, February 15, 2017! Beverly Hills, Calif. – Today Starz, in association with Sony Pictures Television, announced that season three of the Golden Globe nominated series ‘Outlander’ will return in September 2017. The third season will include 13 episodes based upon VOYAGER, the third of eight books in Diana Gabaldon’s international best-selling Outlander series. In March, production and filming on the current season moves from its home base in Scotland to Cape Town, South Africa, to shoot pivotal sea voyage scenes on the former sets of the STARZ original series ‘Black Sails.’ Production on the season began in September 2016 and will wrap in June 2017. ‘Outlander’ will attend San Diego Comic Con again this summer, offering fans a chance to experience more of this beloved series in person. The story picks up right after Claire (Caitriona Balfe) travels through the stones to return to her life in 1948. Now pregnant with Jamie’s (Sam Heughan) child, she struggles with the fallout of her sudden reappearance and its effect on her marriage to her first husband, Frank (Tobias Menzies). Meanwhile, in the 18th century, Jamie suffers from the aftermath of his doomed last stand at the historic battle of Culloden, as well as the loss of Claire. As the years pass, Jamie and Claire attempt to make a life apart from one another, each haunted by the memory of their lost love. The budding possibility that Claire can return to Jamie in the past breathes new hope into Claire’s heart… as well as new doubt. Separated by continents and centuries, Claire and Jamie must find their way back to each other. As always, adversity, mystery, and adventure await them on the path to reunion. And the question remains: When they find each other, will they be the same people who parted at the standing stones, all those years ago? Diana Gabaldon’s eight-book Outlander series has sold more than 26 million copies worldwide and all the books have graced the New York Times best-sellers list. The ‘Outlander’ series spans the genres of history, science fiction, romance and adventure in one grandiose tale. 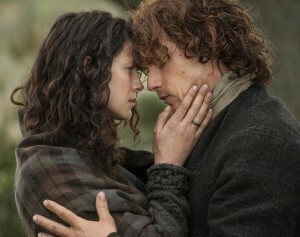 The second season of ‘Outlander’ won the Critics’ Choice Award for Most Bingeworthy Show, and four People’s Choice Awards, including Favorite TV Show. First of this, you wrote another three situation, so jamie saves three times the life of Claire: Jamie marries Claire in order to save her from Black Jack Randall; he save her from Randall at Fort William; he save her again (the three) from Wentworth, sacrificing himself. This is another triangle, I presume, other vertices. They’re six vertices…but three triangles are nine vertices…what are the three missing? I don’t understand…and I always hated geometry! But I want to know what are the other significant events, for you, of the structure of the book. The third triangle is the one among Claire, Jamie and Frank. Glad you’re enjoying the book(s)! I so love your books! I look forward to the next. You made reference in an earlier post to disgruntled book fans and I laughed. I suppose I am one! I cannot bring myself to watch the series, though everyone tells me how good it is. I cannot get past the actor that plays Jamie. How often you refer in your books to Jamie’s brilliant red hair – and yet, there he is on film with hair that barely qualifies as red. In the pictures I need to look close to see that it really is red and not brown. It is certainly not a colour that would ever make him stand out in a crowd – or be such that he would have to cover it when he goes into hiding. Given that the colour of his hair was such an important element of the book, I keep wondering what on earth the thinking was on that? Thank YOU, Catherine! So pleased you’re enjoying the books! Season 4 is being filmed and produced now. The date for showing the new season on Starz in the U.S. has not been announced yet. Yes, there will be a season four! Just wrapped up with filming, in fact. Will be out in some markets in fall, 2018, apparently. Merci pour cette saga, j’ai eu peur de regarder la série télévisée, ce n’est jamais le reflet des livres. Mais je n’ai pas été déçue, je trouve les épisodes dans rendu, l’essentiel y est, pour les fans, les détails viennent recoupés sans mal la série. Est ce que la série télévisée ira jusquà la fin de l’histoire du roman. J’attends avec impatience la série 4 en France, encore merci. Thank you for this saga, I was afraid to watch the TV series, it is never the reflection of books. But I was not disappointed, I find the episodes in rendering, the essential is there, for fans, the details are intersected without difficulty the series. Will the TV series go to the end of the novel’s story? I look forward to the series 4 in France, thank you again.